Oguz Gurel was born in 1968 in Izmit, Turkey. He graduated from the Marmara University, Textile and Art Faculty in Istanbul. He is drawing cartoons for about 15 – 16 years. His artworks were published for the first time in a local newspaper “Kocaeli” in 1989. Then he worked also for a number of various newspapers and magazines. 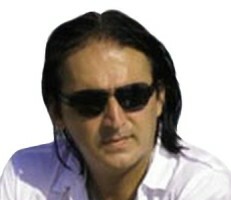 Oguz Gurel published his own cartoon album named “Days with Cartoons”. He is a member of following organisations: FECO (FEderation of Cartoonists Organisations) and Turkish Cartoonists Association. He have been working as a president of the Turkish Cartoonists Association for a year. Oguz Gurel participated at numerous national and international cartoon competitions and his cartoons have been awarded more than 100 important prizes – some of them are: Milliyet Newspaper (Abdi Ipekci) – 2nd prize, Turkish Press Association – 1st prize, Ankara Film Festival – Special prize, Turkish Standard Instıtute – 1st prize (1993), 2nd prize (1994), Special prize (1995), Ankara Cankaya Belediyesi – Special prize, 4th Courage World Cartoon Contest (Taiwan) – 2nd prize, International del Humor (Cuba) – 2nd prize and many other prizes and mentions. He is still drawing for daily newspapers, magazines and websites. Oguz Gurel is living and working in Istanbul, Turkey.